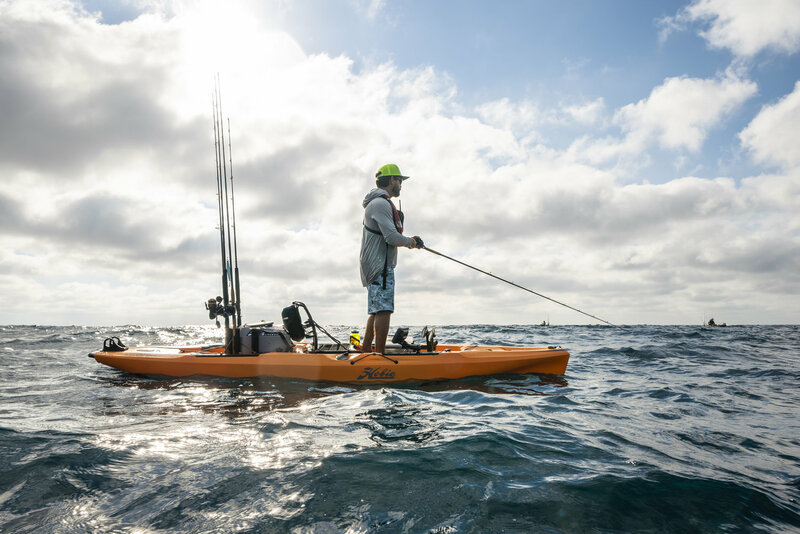 Hobie’s popular fishing kayak receives a full overhaul launching fall 2018. Here are the details. 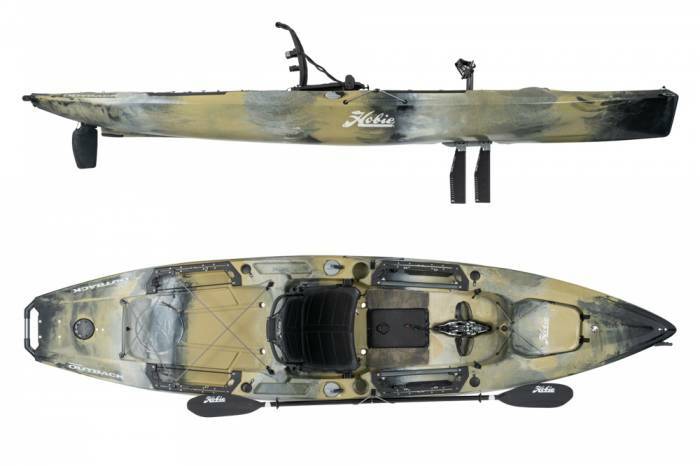 Hobie Kayaks today announced the update of its premium fishing Mirage Outback kayak at Paddlesports Retailer. The update comes after 20 hot-selling years of production. Hobie focused major updates around quietness, speed, and stability. The redesigned hull is the foundation of this relaunch. The new hull design is sleeker at the bow, allowing the kayak to slice through the water and reduce noisy water slap. That reduced noise allows for anglers to approach easily spooked fish in shallow waters for stealthy casting opportunities. Hobie claims its sleek new hull design slices through the water better and cuts down on resistance. Thus, it makes the kayak faster, an improvement in performance over the last hull. The new Outback now comes with the upgraded MirageDrive 180 Turbo Fins. These provide more propulsion with less effort when compared to standard MirageDrive fins. The standing deck on the new Hobie Outback spreads out to 34 inches wide. This deck is designed more as a standing platform. The wider standing deck gives more stability. 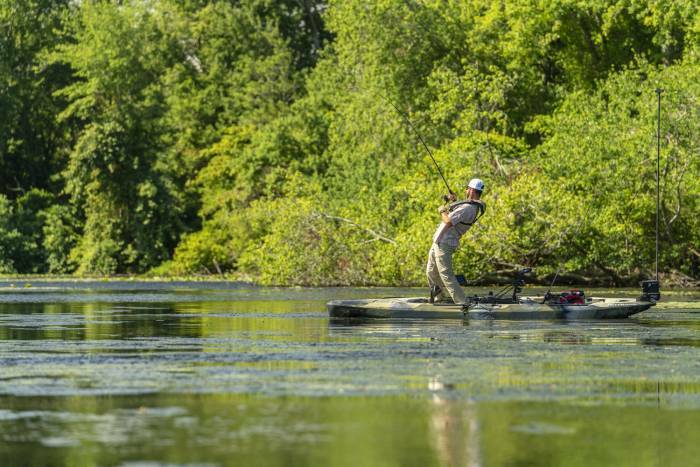 Hobie intends it more specifically as a casting platform than the previous model. The new Outback is also 8 inches longer, which not only helps with stability but also tracking and glide. New storage compartments, cargo hatches, and mesh compartments mean more flexibility to bring gear you might’ve had to leave at home. The Outback also incorporates Hobie’s Guardian Transducer Shield, introduced last month at ICAST 2018. This retractable shield helps protect transducers from impact, retracting into the bottom of the kayak for bumps, beaching, and storage. Major innovative redesign features on the Hobie include a variety of improvements. The newly launched Guardian transducer is a stock upgrade. Tuck the transducer into the internal cavity while transporting or floating over shallow areas. The rudder system no longer hangs off the stern of the kayak, instead tucking completely under the hull. The sides of the bow include the H-Rail deluxe for the highest variety of accessory options. Dual steering allows for control while hands are busy casting or performing other pressing tasks, which includes reaching into a variety of storage options. Other upgrades include a new hatch in the standing deck (with a bottle opener) as well as new bungee systems, tracks, and attachment points in the H-Rail Deluxe system. The new Hobie Mirage Outback is available at select retailers in fall 2018 for $2,799.